Architect Frank Gehry’s design for the Eisenhower Memorial was developed in collaboration with a creative team of artists and engineers. The Eisenhower Memorial Commission, created by Congress, is overseeing creation of the project. 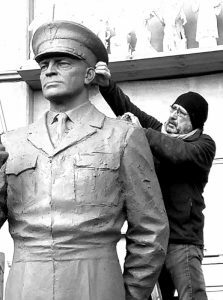 Eylanbekov was selected to design the sculptures that will commemorate Eisenhower as Supreme Commander of the Allied Expeditionary Force in World War II and as 34th President of the United States. His sculptures will be placed at the core of the memorial in the nation’s capital. Statues will be executed in bronze and complemented by bas reliefs carved in stone. One composition of Eylanbekov’s bronze sculptures will represent Eisenhower as the 34th President of the United States, flanked by civilian and military advisers. Another composition of bronzes will represent Eisenhower as Supreme Allied Commander during World War II, with the 101st Airborne Division before their jump into France. Monumental bas reliefs by Eylanbekov will also be a part of the sculptural composition. The memorial will be located within a four-acre urban park on Independence Avenue, across from the Smithsonian’s National Air and Space Museum and adjacent to the U.S. Department of Education. The project is expected to be complete by 8 May 2020, the 75th Anniversary of VE Day. “Being involved in the creation of the Dwight. D. Eisenhower National Memorial and creating sculptures for the memorial is a great honor to me,” Eylanbekov said. “I can’t overstate the importance of this project in my professional and personal life. “The sculptures in this project are created for the public, for the people to observe them, to think and respond emotionally. That is where the visual power of art is most evident. I hope the bronze images will be strong enough to impress the visitors to the memorial and live in their memories. “From the artistic standpoint, in the sculptural composition and in each bronze figure I am trying to express the enormous tension of the moment by using all of my skills as a sculptor. There is no obvious movement in the sculptures. 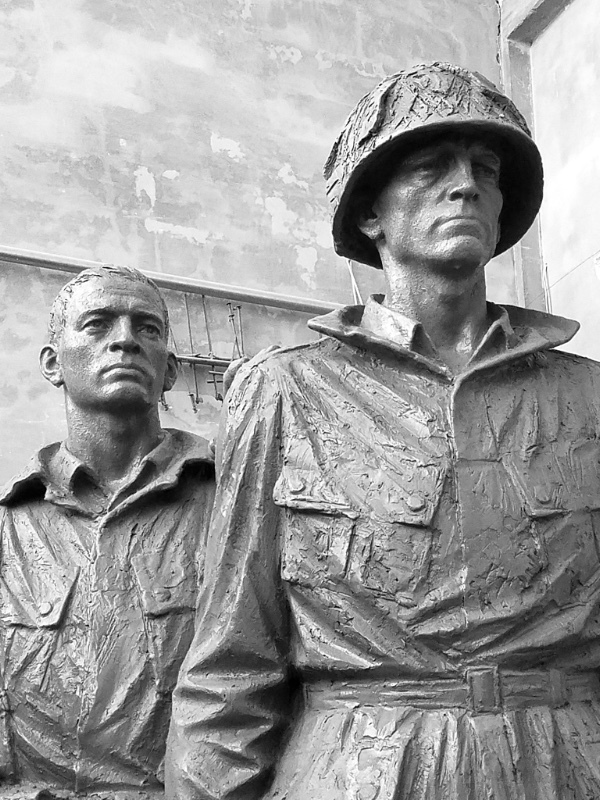 There is only internal pressure and energy expressed through the sculptural form of the faces, hands, and poses of men who are about to go into battle. “I think of this sculptural group of six soldiers as ‘the wall’. They are all different, they have different feelings of what is about to happen, and at the same time they are absolutely united by the event. Each one of them carries the weight of the future of the free world on their shoulders. Many of them are not going to survive the battle. They and their leader understand both concepts. It is a very complex psychological state for the soldiers as well as for their leader. “My goal as a sculptor is to translate in bronze the enormous importance of the moment as well as the eternal concept of an ultimate sacrifice for the most important of reasons. 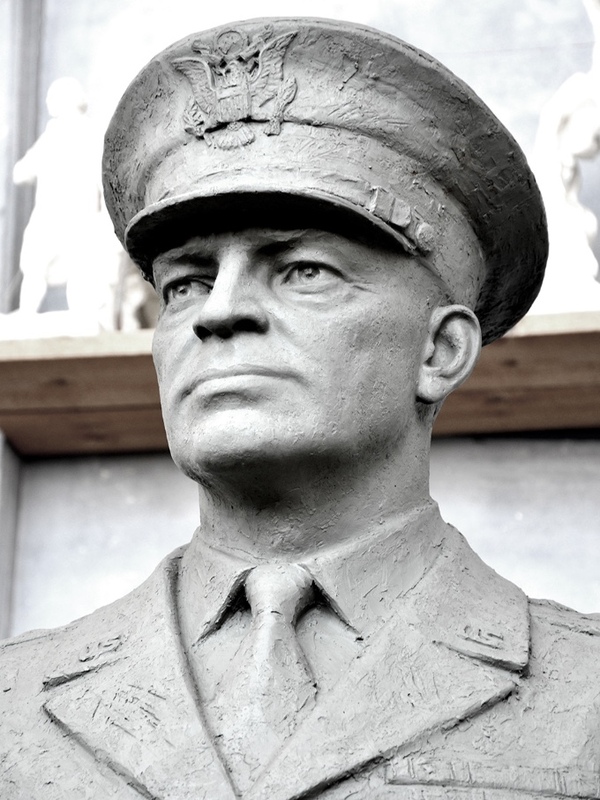 Close-up of full-scale clay model Gen. Dwight David Eisenhower. Image courtesy of Sergey Eylanbekov. Eylanbekov, a world-renowned sculptor, grew up in the Soviet Union. He attended Moscow School of Fine Arts and then the prestigious Surikov Academy of Fine Arts, where he graduated with honors. During the tumultuous period of change that occurred in the 1980s during the Gorbachev era, Eylanbekov decided to start life over in the United States. Speaking no English and desperately short of money, he came to New York and then proceeded to work his way up to the top of his profession, becoming an American citizen along the way. In the past quarter century his ascent has continued as his artwork has garnered praise all over the world. Eylanbekov has had a close relationship with the Academy for many years and was selected as Sport Artist of the Year in 2004. Eylanbekov’s bronze torsos entitled “Venus and Mars” are featured at the entrance to the Academy’s American Sport Art Museum & Archives (ASAMA). The Academy has dedicated the sculptures to Olympians Prince Albert II and Princess Charlene of Monaco, who have been active in the Olympic and Special Olympic movements. For many Summer Olympiads, the International Olympic Committee (IOC) called upon its national affiliates to hold art competitions leading up to an international contest, and for numerous Olympiads the Academy coordinated the contest for the United States Olympic Committee (USOC). Eylanbekov earned significant international attention in 2004 for his sculpture, “Five Continents,” a cast acrylic sculpture that depicts six human figures, with one symbolizing Greece and the others depicting people from five continents of the world. The Olympic Rings are embedded in the sculpture. It won the USOC Sport and Art Contest and went on to win first place internationally among entries from 39 countries in the IOC’s Sport Art Competition in Lausanne, Switzerland, for the 2004 Athens Olympics. Previously, he was one of the official artists for the Salt Lake Olympic Winter Games in Salt Lake City, Utah, in 2002. Eylanbekov has been commissioned to create monumental statues of historical and political figures around the world. Among those are statues of second United States President John Adams and Continental Congress President and Massachusetts Governor John Hancock for the city of Quincy, Mass., which will be dedicated this fall; and his monumental bronze Peer Gynt and Three Herd Girls unveiled in Oslo, Norway in 2010. He created a sculpture for a gift from the Gabonese Republic to soccer legend Pelé at the African Cup of Nations, as well as the sculpture representing Dwight David Eisenhower for the global award by the Business Council for International Understanding (BCIU). He has been awarded exhibitions at the United Nations headquarters in New York and the Museum of Modern Art in Moscow, Russia. For more on the Eylanbekov sculptures including photos, go to: www.eisenhowermemorial.org/sites/default/files/public/press/General%27ly%20Speaking%20-%20Dispatches%20from%20the%20Eisenhower%20Memorial%20Commission%20%28June%206%20-%20Special%20D-Day%20Edition%29.pdf.